"The Boy at the Battle of Gettysburg"
"A Boy's Experiences during the Battle of Gettysburg"
Daniel Skelly was a Gettysburg teenager in 1863, employed as a clerk at a Gettysburg dry goods company. His experiences during the three days of the Battle of Gettysburg were exciting and unique. After retirement, Skelly wrote about his experiences as a young boy in a town filled with the sights and sounds of a war which, up to this point, had been very far away. He saw and met several famous people during the three days of battle, spoke with Confederate soldiers camped on the streets outside of his home, and afterward helped aid the wounded that filled the homes and churches in town. Published in 1932, A Boy's Experiences During The Battle of Gettysburg, is one of the more outstanding civilian accounts of the battle, from the perspective of an old gentleman who witnessed the true nature of war with its devastation and heartache, for the first time in his home town. 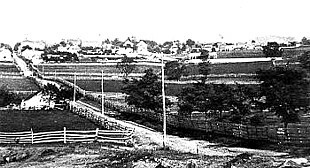 (Left) Picture of the town of Gettysburg in 1863. West Middle Street runs through the center of this photograph. The county courthouse is in the left distance on the skyline. "Early's Division had occupied Gettysburg that day and made demands upon the town which were not complied with. Consequently I was obliged to remain in Hanover all night. On the morning of June 27 White's Confederate cavalry passed through Hanover and remained long enough to get some packages from the express office, one of which was for my firm and which I saw them open. It contained gloves. They appropriated them. They also captured a jeweler with his stock loaded in a wagon, who was a little late in getting started out of town, and appropriated his stock also. On the afternoon of this day, Thaddeus Slentz, Edward Craver and myself secured a hand-car and started for Gettysburg on the Gettysburg and Hanover railroad, but when we reached New Oxford we found the bridge over the Conewago Creek had been burned. So we were obliged to abandon the car and walk the remaining ten miles to Gettysburg, reaching there about 5 P.M.
"The 28th and 29th were exciting days in Gettysburg for we knew the Confederate army, or a part of it at least, was within a few miles of our town and at night we could see from the house-tops the campfires in the mountains eight miles west of us. We expected it to march into our town at any moment and we had no information as to the whereabouts of the Army of the Potomac. We little dreamed of the momentous events which were soon to happen right in our midst. On June 30th two brigades of General Buford's division of cavalry reached our town, coming in from the south and I well remember how secure this made us feel. We thought surely now we were safe and the Confederate army would never reach Gettysburg. On the afternoon of this day about 4 o'clock, I stood on the Cobean corner on Chambersburg Street… while General Buford sat on his horse in the street in front of me, entirely alone, facing to the west in profound thought. I remember this incident very distinctly for it made a deep impression on (me). It was the only time I ever saw the general and his calm demeanor and soldierly appearance, as well as the fact that his uniform was different from any general's I had ever seen. He wore a sort of hunting coat of blouse effect. On the night of the 30th, the people of Gettysburg settled down in their homes with a sense of security they had not enjoyed for days and with little thought of what the morrow had in store for them. "On the morning of July 1, about 8 o'clock, in company of my old friend Samuel W. Anderson… I walked out the Mummasburg Road north of the town just a short distance beyond the college building, where lay encamped in the fields, Col. Deven's Brigade of Buford's Division… which with Gamble's Brigade of the same division had come into our town on the previous day. While we stood at Col. Deven's tent an order was handed him… directing him to move his brigade west of the town, as the Confederates were then advancing on the town by the Chambersburg Pike. My companion and I went directly across the fields to Seminary Ridge, then known as the Railroad Woods by reason of the 'Old Tape-worm Railroad' being cut through it. Anderson went toward the Theological Seminary buildings expecting to get (to) the cupola of the building. I remained on Seminary Ridge just where the old… railroad cut through it. The ridge was full of men and boys from town, all eager to witness a brush with the Confederates and not dreaming of the terrible conflict that was to occur on that day and not having the slightest conception of the proximity of the two armies. 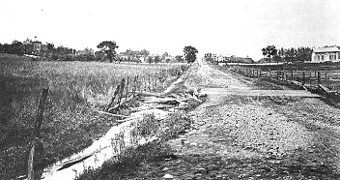 (Left) Photograph of Seminary Ridge and the Chambersburg Road in 1863. It was near the Lutheran Seminary building at left that Skelly perched himself in a large oak tree to watch the battle west of town. "I climbed up a good-sized oak tree so as to have a good view of the ridge west and northwest of us, where the two brigades of cavalry were then being placed. We could then hear distinctly the skirmish fire in the vicinity of Marsh Creek, about three miles from our position and could tell that it was approaching nearer and nearer as our skirmishers fell back slowly toward the town contesting every inch of ground. We could see clearly on the ridge … the formation of the line of battle of Buford's Cavalry, which had dismounted, some of the men taking charge of the horses and the others forming a line of battle, acting as infantry. Nearer and nearer came the skirmish line as it fell back before the advancing Confederates, until at last the line on the ridge beyond became engaged. Soon the artillery opened fire and shot and shell began to fly over our heads, one of them passing dangerously near the top of the tree I was on. There was a general stampede toward town and I quickly slipped down from my perch and joined the retreat to the rear of our gallant men and boys. I started for town (and) crossed… over a field to the Chambersburg Pike on the east side of Miss Carrie Shead's School and when about the middle of the field a cannon ball struck the earth about fifteen or twenty feet from me, scattering the ground somewhat about me and quickening my pace considerably. "When I reached the pike, there galloped past me a general and his staff, who upon reaching the top of the ridge, turned into the lane toward the Seminary building. This I have always believed was General Reynolds coming onto the field and going to the Seminary where he had an interview with General Buford… before going out where the battle was in progress. The time was about 9 o'clock or near it, and our infantry had not come up yet. I was not long in reaching town and found the streets full of men, women and children, all under great excitement. Being anxious to see more of the battle, I concluded I would go up upon the observatory on the store building of the Fahnestock Brothers, situated on the northwest corner of Baltimore and West Middle Streets, and just across the street from the court house. The observatory was on the back of the building fronting on West Middle Street and… had a good view of the field where the battle was then being fought. (Left) Picture of Fahnestock's Store on Baltimore & West Middle Streets, ca. 1888. "In company with Mrs. E.G. Fahnestock, wife of Col. Fahnestock, Isaac L. Johns and Augustus Bentley, I went up through the store to the observatory… (that) had a railing and benches around it and was about eight feet or more square. We had been up there quite a little time when I observed a general and his staff coming down Baltimore Street from the south of the town. Upon reaching the court house, they halted and made an attempt to get up into the belfry to make observations, but they were unable to accomplish this. I went down into the street and going over to the court house told them that if they wished they could go up on the observatory of the store building. The general dismounted and with two of his aides went with me up onto the observatory. Upon reaching the house-top, the general, with his field glasses, made a careful survey of the field west and northwest of the town; also the number of roads radiating like the spokes of a wheel from the town. In the midst of it a scout came riding up West Middle Street at a full gallop, halted below us (and) called up, asking if General Howard (Gen. Oliver Otis Howard, commander of the Eleventh Corps of the Army of the Potomac) were there. General Howard answering in person, the scout called to him that General Reynolds had been killed and that he should come onto the field immediately. This scout was George Guinn, a member of Cole's Maryland Cavalry, and was from our county. I knew him well and recognized him at once. Upon receiving this message the General, his staff officers and myself went down into the third story ware-room, when General Howard stopped and gave orders to one of his aides to ride back and meet his corps, which was then on the march from Emmitsburg, Md., ten miles from Gettysburg, and direct General (Adolph von) Steinwehr, upon reaching the field to occupy Cemetery Hill and fortify it. General Howard, as he came into Gettysburg, had noticed the prominence of this hill, and riding up to the cemetery was impressed with its commanding position. To his other aide he gave some directions regarding the bringing up of his corps. One thing which he said that I remember was that the bands should be placed at the head of the columns and play lively airs as they advanced. General Howard was perfectly calm and self-possessed and I remember this made a lasting impression on me. And his orders became so fixed on my mind that I have never forgotten them. "As we passed down through the house, we met Mrs. Samuel Fahnestock, then an old lady, who was very much agitated. The General stopped and spoke a few kindly words to her, which relieved her anxiety considerably. He then rode out to the front. After some little time had elapsed we heard a commotion down in the street (West Middle) and upon looking down saw a column of Confederate prisoners under guard of the Boys in Blue, being conducted to the rear. It proved to be the Confederate General Archer and several hundred of his brigade who had been captured by the Iron Brigade. We remained on the house-top until near noon, when it became a little dangerous to stay longer and we went downstairs again. But shortly after 12 o'clock another officer came along and asked to be taken up where General Howard had made his observations. He was a captain and belonged to the Eleventh Corps (and) remained only a short time. I learned after the battle that this officer's name was Frederick Otto Baron Von Fritche, and that he had written a book entitled "A Gallant Captain of the Civil War", in which he made mention of my taking him up on the roof and giving him some information in regard to the field and the battle then going on. (About) Photo of the "Returning to Gettysburg" after the Civil War. General Howard paid a visit to the roof of the Fahnestock Building. 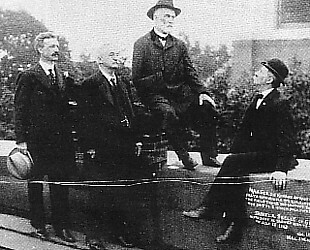 The general is in the center of the group, seated on the chimney. Daniel Skelly stands at left. "After he had gone I walked down to our Centre Square and there met my mother carrying two buckets of water, looking for one of the improvised hospitals, to give it to the wounded. It was a striking irony of war that at that time two of my brothers, members of Company F, 87th Pennsylvania regiment, should be prisoners of war, having been captured at Winchester, Va., in an engagement while the Confederate army was on its way to Gettysburg. One of them was mortally wounded and in a southern hospital but a kind Providence withheld this from us until after the battle here. We went down Carlisle Street to the McCurdy warehouse, just below the railroad, where the wounded were being brought in… No provision had yet been made for their care in the town and they were laid on the floor. We remained there quite a while giving them water and doing what we could for their relief. "I stood on the Cobean corner of Chambersburg Street as Schimmelfenning's Division of the Eleventh (Corps) passed through town on its way to the front. The day was hot and sultry and they were marching "quick time", all seeming eager to get to the front. All along Washington Street the people of the town were out with buckets of water and the soldiers would stop for a moment for a drink and then hurriedly catch up to their place in the line. They appeared to be straining every effort to reach the scene of conflict, and yet not an hour elapsed before the slightly wounded were limping back and those badly wounded were being brought back in ambulances to the improvised hospitals in the town. The hospitals were located in warehouses, churches, the court house and in various private homes. Many others were left dead on the field they were so heroically eager to reach such a short time before. "As the afternoon wore away the churches and warehouses on Chambersburg, Carlisle, and York Streets nearest the line of battle, were filled with wounded. Then the court house, as well as the Catholic, Presbyterian and Reformed churches and the school house in High Street received the injured soldiers, until those places had reached their capacity, when private homes were utilized, citizens volunteering to take them in and care for them. In company… with Miss Julia Culp, a neighbor (who) had a brother in the Confederate Army who was killed on Culp's Hill and a brother in the Union Army, who survived the war, I went into the court house with buckets of water and passed from one to another of the wounded relieving them as best we could under the circumstances. Some of them were so frightfully wounded that a lady could not go near them. These I gave water to, while she cared for those who were not so severely wounded. Quite a number of our townspeople were there doing everything they could in the relief work as the wounded were carried in. "When our forces were being driven back through the town in the afternoon, I went home feeling that everything was lost and throughout my life I have never felt more despondent. One of the regiments of the Iron Brigade in falling back through town about 4 o'clock in the afternoon passed our house on West Middle Street. As they turned into (the) street from Washington Street, one of the lieutenants was wounded in the foot but kept up with his regiment until he reached our house. He was unable to go any further. He came into the yard. Separating the Bowen house next door and ours, there was an areaway used by both of our families and at the Bowen house was an old-fashioned cellar door standing open, He took off his sword and pistol and sword belt… hobbled down (the steps) and hid them in the cellar(,) then came up to get his sword, when the Confederates came into the yard and made him a prisoner, taking his sword away from him. My mother, standing in our kitchen doorway, seeing he was wounded, asked the Confederates to allow him to come into our house and she would care for him. They allowed him to come and then continued in pursuit of our retreating forces. My mother took him into one of the inner rooms and kept him there without the Confederates finding out. After the battle he was taken to one of the hospitals. In a week or more he was convalescent and came to see is on his way to join his regiment. He sent me over to the Bowen cellar to get his accoutrements and presented them to me, saying that when he got to Washington he would get a new outfit. We never heard from him afterwards. "When I went out in front of the house about 7 o'clock in the evening, the Confederate line of battle had been formed on East and West Middle Streets, Rodes Division of Ewell's Corps lying right in front of our house. We were now in the hands of the enemy and in passing, I want to pay a tribute to these veterans of the Confederate Army. They were under perfect discipline. They were in and about our yard and used our kitchen stove by permission of my mother... gentlemanly and courteous to us at all times, and I never heard an instance to the contrary in Gettysburg. We settled down quietly this night. There was no noise or confusion among the Confederate soldiers sleeping on the pavement below our windows and we all enjoyed a good night's rest after the feverish anxiety of the first day's battle." "The general rode quietly by unattended and without any apparent recognition from the Confederate soldiers along the street. (H)e reached Baltimore Street, about a square away at the court house, (and) turned into it going up to High Street. I was later informed… that he had gone to the jail, presumably for conference, but with whom has only been surmise(d). The afternoon… I spent in the yard back of the Fahnestock store on West Middle Street. There was a high board fence the length of the lot, extending to an alley at the end. There were two large gates opening to the street along which the Confederate line ran. A Confederate major of one of the regiments was my companion. I do not remember his name or the regiment to which he belonged, but he told me he was originally from Pittsburgh, going south years before the war. Our conversation was about the war and the causes leading up to it and the result thus far on both sides. He was a fair minded man and reasonable in his opinions, there being no rancor or bitterness evident in any of observations on the progress of the conflict. About 4 o'clock an interruption was caused in our conversation by a terrible cannonading off to the southwest of town and we separated, he joining his regiment in the street and I going to my father's house near the Fahnestock store. Our town being in the hands of the Confederates and cut off from all communications with the outside world, we knew nothing about our army and were completely in the dark as to how it was located and how much of it had arrived on the field. The Confederates maintained a clam-like silence on all matters concerning the battle, hence we did not know the significance of this tremendous cannonading until after the battle was over… But for the present it sent everyone to the cellars as a matter of protection. Mr. Harvey D. Wattles lived close to my father's and under his house was a large dry cellar. During the cannonading the neighbors congregated in it as a place of safety. My mother and the rest of the family were there during the afternoon and I was there at intervals while the period of uncertainty caused by this artillery fire existed. An incident that occurred in this house… will give some idea of what families were exposed to while the fighting was in progress. A neighbor had come into the house to take refuge and had brought with her a band-box containing a bonnet. When the cannonading began, she went to the cellar, placing the box on the chair upon which she had been sitting. When she came from the cellar she found the box where she had left it, but a minie ball had passed through the box and the bonnet. "About dusk, Will McCreary and I were sent on some errand down on Chambersburg Street and as we were crossing from Arnold's corner to the present Eckert corner, we were halted by two Confederate soldiers who had a lady in their charge. She was on horseback and proved to be the wife of General (Francis) Barlow who had come into the Confederate lines under a flag of truce looking for her husband, who had been severely wounded on July 1, and as she was informed, had been brought into the town. She informed us he was with a family 'named McCreary' on Chambersburg Street. We directed her to Smith McCreary's residence (though) she did not find the general there… for he had been taken from the field to the farmhouse of Josiah Benner on the Harrisburg Road just where the covered bridge crossed the creek. The night of the second I slept in a room above the Fahnestock store with a number of other boys. Not making any light we would remain quietly at the window trying to catch the conversation of the Confederate soldiers who were lying on the pavement below the window. We were eager to catch something that would give us some clue to our army and how they were fairing in the battle…, but did not learn much from them. We finally went to bed and settled down into a sound sleep as boys do who have few cares and sound health. "At intervals during the night I was awakened and could hear the rattle of musketry fire off to the southeast of town, and it did not seem very far away. When we got up in the morning of the third of July this firing was a lively as during the night, with the addition of some artillery fire and continued until about 11 o'clock in the morning. About that hour I was down at my father's house and quite a number of Confederate soldiers came into the yard to the old 'draw well'. They were all begrimed with powder and were 'washing up'. Their remarks about a hill they were butting up against were neither moral nor complimentary. Of course we were in the dark as to the cause of their discomfiture. The balance of the morning passed quietly and until about 1:30 P.M. there seemed to be a lull in the activities on the field. At least it seemed so to us, confined to the limits of the town. About 1:30 however, pandemonium broke loose along the lines of battle and for one hour there was a din of cannonading, unprecedented on the continent. And then an ominous calm ensued. What did it mean? We did not know. Nor could we surmise. But I ventured out cautiously from our retreat which was our place of safety during the cannonading, and walked up to the Fahnestock corner. However I could learn nothing then about the conflict. "The alleys and street leading up toward the cemetery were barricaded and the Confederate soldiers behind them in line of battle, were prepared to defend (against) any attack from Cemetery Hill. There was a long calm, perhaps an hour, when again the artillery opened up from Cemetery Hill, all along the line of battle to the Round Tops and the rattle of musketry then all over the line except for intervals when great cheers went up from the mighty hosts of the Boys in Blue. But there were no rebel yells such as we heard from time to time during the three days' battles. This demonstration occurred, we learned later, when Pickett's charge failed. But we were to remain ignorant of what the great conflict of the day would bring to us, who were still in the hands of the enemy. On this night, I went to bed restless and was unable to sleep soundly. About midnight I was awakened by a commotion down in the street. Getting up I went to the window and saw Confederate officers passing through the lines of Confederate soldiers bivouacked on the pavement below, telling them to get up quietly and fall back. Very soon the whole line disappeared but we had to remain quietly in our homes for we did not know what it meant. "About 4 A.M., there was another commotion in the street, this time on Baltimore, the Fahnestock building being at the corner of West Middle and Baltimore Streets. It seemed to be a noisy demonstration. Going hurriedly to the window I looked out. Ye gods! What a welcome sight for the imprisoned people of Gettysburg! The Boys in Blue marching down the street, fife and drum corps playing, the glorious Stars and Stripes fluttering at the head of the lines. They picked up the Confederate soldiers who had been left behind in the retreat and were marching them to the rear at double-quick. It was raining right briskly at this time. I got into my clothes hurriedly and went down o the front door but did not venture out. As the morning advanced, however, we went about the town mingling with our people, comparing notes and finding out how all had fared during the days we were in the hands of the enemy. "We soon learned that part of the town was still not free from 'Our friends- the enemy'. They had thrown up formidable breastworks extending from the Railroad Woods clear out along the ridge to Emmitsburg Road and beyond it and they were occupied by Confederate soldiers to protect the retreat of their army. As my father's house was on West Middle Street, which extends in a direct line out to Haupt's Hill, which was along the embattled ridge, we were exposed during the whole day to sharpshooters' fire. The Confederates had built little works of stone and ground, just large enough to cover their heads and protect their bodies, extending down the hill in the direction of town. And they lay behind them all day with guns loaded ready to bang away at any suspicious object in the street. Sometime during the morning, several of our officers rode down the street and when about half the length of the square from Baltimore and Washington Street, one of them was hit in the fleshy part of his army by a bullet, evidently causing a very painful wound, for he yelled at the top of his voice. "On this morning, the 5th, my friend 'Gus' Bentley met me on the street and told me that down at the Hollinger warehouse where he was employed they had a lot of tobacco. 'We hid it away before the Rebs came into town,' he continued, 'and they did not find it. We can buy it and take it out and sell it to the soldiers.' Like all boys of those days we had little spending money but we concluded we would try and raise the cash in some way. I went to my mother and consulted her about it and she loaned me ten dollars. Gus also got ten, all of which we invested in the tobacco. It was in large plugs- Congress tobacco, a well known brand at that time. With an old-fashioned tobacco cutter we cut it up into ten cent pieces and each of us took a basket full and started out Baltimore Street to the cemetery, the nearest line of battle. Reaching the Citizens Cemetery we found a battery of artillery posted there… The soldiers stopped us and would not let us pass, their orders being not to let anyone out of the town. We went back into the town as far as the Presbyterian church and went up High Street to the jail, where we turned into a path leading down to the old Rock Creek 'swimmin' hole'. On the first ridge we saw the first dead Confederate soldiers lying right on the path, two of them side by side, and they were buried there afterward until the Confederate bodies were taken up years later and shipped to Richmond for burial. We kept to the path down to the spring (,) then turned over towards Culp's Hill, ascending it at one of its steepest points. There were all kinds of debris of the battle scattered over the hill, but no dead or wounded soldiers, they having already been removed. (Left) Photograph of breastworks near the summit of Culp's Hill where Skelly and his companion sold packets of tobacco to Union soldiers. "The breastworks were formidable looking, about three feet or more high, built of trees that had been cut down by the soldiers for the purpose of throwing up these fortifications. A shallow trench was dug in front of the works and the ground thrown up on it. The soldiers helped us over the breastworks with our baskets and in a short time they were empty and our pockets filled with ten-cent pieces. The soldiers told us to go home and get some more tobacco, that they would buy all we could bring out. We made a number of trips, selling out each time, and after disposing of all our supply, and paying back our borrowed capital, we each had more money than we ever had before in our lives. "On Monday, July 6, I made my first trip over our line of battle out to the Round Tops. Fences were all destroyed and the country all open so that we could drive or walk across country instead of having to take the Emmitsburg or Taneytown Roads. The whole countryside was covered with ruins of the battle. Shot and shell, guns, pieces of shells and bullets were strewn about the fields in every direction and everything that the carnage of battle could produce was evident. 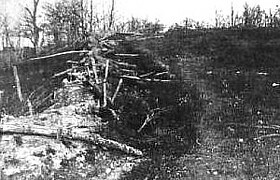 Ziegler's Grove showed the effects of the Confederate artillery fire. Good-sized trees were knocked off and splintered in every imaginable way. The bodies of horses that had been killed were lying about. 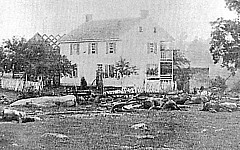 Meade's Headquarters, soon after the battle. 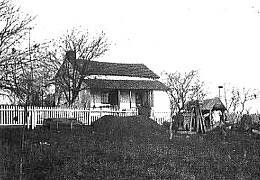 The sight around Meade's headquarters along the Taneytown Road was terrible, indicating the exposed position it occupied, subject to every shot and shell that came over the ridge above it. Around the house and yard and below it lay at least 12 or 15 dead horses, shot down no doubt while aides and orderlies were delivering orders and messages to headquarters. A short distance below the house there was a stone fence dividing a field. Across this was hanging a horse which had been killed evidently just as he was jumping the fence, for its front legs were on one side and the hind legs on the other. In the road a short distance away was another horse which had been shot down while drawing an ambulance. In the front room of the house was a bed, the covers of it thrown back; and its condition indicated that a wounded soldier had occupied it. I was told that General Butterfield, Meade's chief of staff, who had been wounded, had been placed upon it before being taken to a hospital. The Peter Trostle House, July 5-6, 1863. "This, my first sight of a great battlefield, with all its carnage, ruin, suffering and death- and witnessed the day after the conflict- made a deep and lasting impression on my young mind, stamping war on my memory as too horrible to even think about. "During the several days our town was in the hands of the enemy, our wounded who had been brought in while the first day's battle was in progress and placed in churches, schools, and in many private homes, were well cared for. The people of the town responded wonderfully in this emergency service. Mothers and daughters acted as nurses in the hospitals nearest their residences, and also provided all kinds of food and delicacies for the wounded. In the days following the battle, the firm of Fahnestock Brothers received numerous inquires about wounded soldiers who were scattered over the field in the hospitals hastily set up at points most conveniently located to take care of the casualties. With Mrs. E.G. Fahnestock, I frequently rode back and forth among these stations, either in buggy or on horseback, looking for wounded men about whom information was sought. Sometimes it was difficult to locate them. We made other trips to the hospitals in the college and seminary buildings also. Frequently on these trips were included supplies of delicacies for the men. So it was that the people of Gettysburg assisted in every way in solving the problems that arose incident to the great battle. The months following the conflict found many extra burdens placed on the town, but there was a willing response on the part of its citizens on all occasions and the confusion that might be expected as an aftermath of such a staggering calamity was reduced to a minimum." 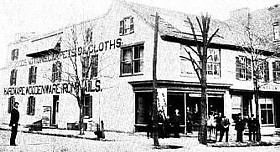 Daniel Skelly went on to become a very successful Gettysburg businessman and member of the local Masonic Lodge. He retired in 1929 from a business career that spanned seventy-two years. Only due to the persistent encouragement of his children did Skelly complete the story of his experiences, written in 1932. He died later that year at the age of 87 and is buried in Gettysburg.